It’s been awhile since I found a game that I was genuinely afraid to try. Stifled is one of those games. 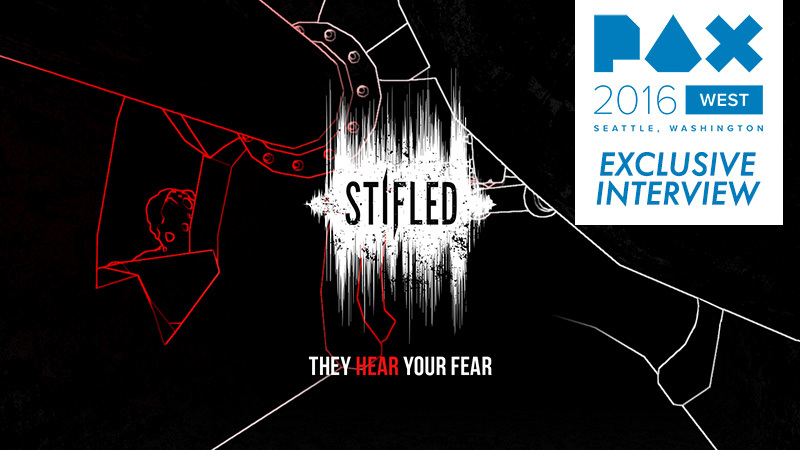 Currently being developed by Gattai Games, Stifled is “a Mic-Enabled Sound-Based Stealth Thriller, where sound is the only way you see and the enemies HEAR your fear.”† Stifled combines the sounds made by you and your in-game character to reveal the hidden game world through the use of ‘echolocation’. The more noise you and your character make, the more of the world that gets revealed. However, that world is full of creatures that are lurking in the shadows and are attracted to noise. During Pax West, I got the chance to try Stifled. Instantly, I can tell that it catered to my survival horror side. The demo began beside a crashed car. Alongside the crash is a trail of blood leading you into the dark woods. The world transforms from bright visuals into a 2D world. In this new world, White is good, Red is bad. These colored outlines reveal your surroundings as you delve deeper into the woods. As you continue, you’ll find collectibles that unlock the game’s mysteries even further. The demo ended with the discovery of an in-game monster that turned the world red. If you’re a horror game fan, Stifled will have to be a must for you. I love that I can’t rely on visual cues to figure out puzzles. Instead I have to think about how to get around obstacles in a new way. Figuring out the right amount of noise to make as you discover what lies ahead in order to escape trouble has me yearning for more! Are you also curious to learn a bit more? Why not check out our brief interview with Justin from Gattai Games as we chat about Stifled. Stifled was previously code-named Project Echo and is the spiritual successor to Lurking, an award-winning student game that was developed over a course of 6 months at Digipen Institute of Technology, Singapore. More info on Lurking can be found at www.lurking-game.com.